Native of Korea, Junghwa Lee performs actively in solo recitals, chamber concerts and lecture recitals, and has frequently appeared in concerto performances as a soloist including those with the Korean Symphony Orchestra, Eastman School of Music Student Orchestra, Salina Symphony Orchestra, Hutchinson Symphony Orchestra and Greeley Philharmonic Orchestra among others. She has presented solo performances in Holland, France, Canada, Australia, New Zealand, Singapore, Thailand, China, Korea and the United States. Winner of many competitions in Korea, including Sonyun-Hankuk-Ilbo, Wolgan-Eumak, Seoul National University Symphony Orchestra Concerto Competition and the Korean Symphony Orchestra Concerto Competition, she received the Performer's Certificate from the Eastman School of Music, along with the Max Landow Memorial Scholarship for outstanding doctoral students and the Liberace Foundation Scholarship for Performing/Creative Artists. As an active collaborator as well as soloist, she received the Excellence in Accompanying Award from the Eastman School. With her interest in promoting music for young students and the community, she has also performed several times at the "Young People's Recital" as a guest solo artist, and has initiated and directed musical events, such as the Hays Spring Music Project and Scholarship Musicale in the Hays, Kansas area. As a dedicated teacher as well as performer, she has taught at many clinics, festivals and masterclasses, and organized the Fort Hays State University (FHSU) High School Piano Competition and the FHSU Summer Piano Camp. She directed the Cottonwood Music Project, a weeklong chamber music outreach program and concerts, during 2003-2005. 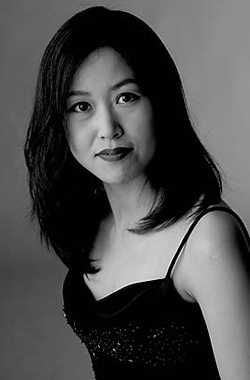 Dr. Lee received her Bachelor of Music and Master of Music degrees in Piano Performance from Seoul National University, and her Doctor of Musical Arts degree in Piano Performance and Literature from the Eastman School of Music. She joined the music faculty at Southern Illinois University Carbondale (SIUC) in August 2005. Prior to joining SIUC, she served as Assistant Professor of Piano at Fort Hays State University and Visiting Assistant Professor of Piano at Oklahoma State University.